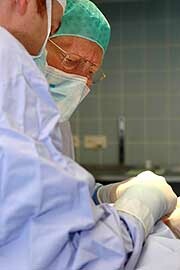 If reconstructive surgery is performed to fix bad functions caused by developmental abnormalities, by birth defects, trauma or injury, tumors, infection or disease, cosmetic surgery is only performed to improve the patient's appearance and self-esteem by reshaping normal structures of the body. To be more clear, cosmetic surgery has nothing to do with body function improvement, it is just an attempt to take the norm. It is a case of a 65-year-old woman who has wrinkles and excess skin under her jowls and chin, and do a neck and face lift in order to give her a new youthful appearance but not to make her look like she's 30. Not very long ago, a facelift was considered to be reserved just for celebrities and movie stars. The mentality has changed and now people believe that a facelift is not just for the rich and famous. Today facelift is one of the most well accepted and most frequently performed cosmetic procedures in the world. It is amazing that more and more men apply for this kind of procedure. Cosmetic surgery is a big decision as it can have a big impact on a person's life. The main goal of a facelift procedure is to give a fresher and younger look to the patient, preserving her/his natural characteristics, unless the patient has some reasons to change a natural look too. Technically, a normal facelift operation used to tighten only the skin, placing all the tension on the suture line. Since the skin has an enormous capacity for expansion, results were short lived and many times with the appearance of an overdone mask. With a better knowledge of anatomy, the new facelift procedures transfer the skin tension to the deeper anatomical layers. Therefore, no excessive stress tension is applied to the skin. The skin is lifted outward and the underlying tissues and muscles are tightened and redraped. Excess skin is removed, and if necessary, excess fat is aspirated from the neck and jawline areas to redefine these areas. To ensure the finest scars possible, the skin is sutured without tension. With a virtually undetectable scar, the results are remarkable leaving the natural beauty of the individual. Valerian D is a freelance writer specialized in health issues affecting men and women. Visit http://www.skin-cosmetics.biz for more information.